Phone calls and text messages represent 70% or more of all inbound customer engagements from online and mobile website visits. Unless you're connecting every call to the campaign or keyword that delivered it, you cannot effectively optimize your marketing investments. KeyMetric International Call Tracking gives you the power to easily identify the campaigns, media buys and PPC keywords that generate every inbound phone call and lead to maximize your marketing ROI as much as 400%. Adjusting your ad spend and keyword bids based on phone calls and customer engagements, instead of just click-throughs and visits, means you can immediately stop spending money on ads and keywords that fail to deliver any value.
" Instantly know Which campaigns, content, media buys & PPC keywords are generating phone calls, customer engagements & leads "
KeyMetric is the only call tracking service capable of providing reliable and affordable international toll-free and local call tracking services in 60+ countries around the world. Our extensive network of Tier-I partner carriers means your calls always connect without issue. And unlike other services, we don't re-route calls through US-based switches to double your per-minute fees. 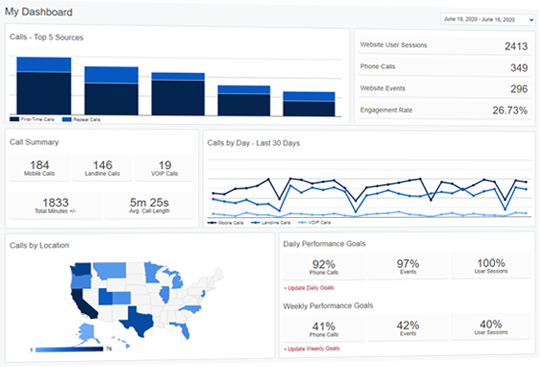 KeyMetric seamlessly pushes phone call conversion data to Google Analytics, Google AdWords, Bing Ads, Acquisio, Salesforce.com, DashThis, and more. This feature supports customers looking to view their KeyMetric call conversion data with other information provided by independent third-party services and systems. For Google Analytics and AdWords, simply provide KeyMetric with your Google Account ID. That's it. No changes are required to your website or Google Account. And once your KeyMetric call data is integrated with Google Analytics, you can seamlessly import it into Google AdWords to view as conversions. For those customers (and call tracking vendors) looking to integrate KeyMetric analytics data with internal systems or with other third-party Enterprise reporting systems, we provide the KeyMetric API; an XML Web Services API to pull KeyMetric call conversion data, in real-time, to nearly any third-party system. For directory pages, interactive maps or business with multiple locations - KeyMetric can display a unique tracking phone number for each physical location or office on the same webpage.